The Chain cent was America’s first large cent and the first circulating coin officially produced by the United States Mint. It was struck only during 1793. The obverse design consisted of a stylized Liberty head with flowing hair. The inscription “LIBERTY” appeared above the portrait, and the date below. The design was rather sparse and empty compared to those that would come later. The reverse’s central design figure, for which the coin is named, is an interlocking chain with 15 links, representing the 15 American states in existence at that time. Both the words “ONE CENT” and the fraction “1/100” appear within the chain. Along the outer edge is inscribed “UNITED STATES OF AMERICA”. On the first working die, the engraver failed to allow adequate room for the entire inscription, and it had to be abbreviated to “UNITED STATES OF AMERI.”. These early dies were cut by hand, rather than being made from master hubs as is the practice today. The edge of these coins is decorated with bars and vines with leaves. Chain cents were struck during late February and early March 1793; records indicate that approximately 36,103 were produced. However, the public reaction to the coins was largely negative. One newspaper criticized the appearance of the Liberty head, saying that it appeared to be “in a fright”. And, while the reverse chain had been intended to symbolize the togetherness of the newly formed Union, many commentators instead interpreted it as representative of slavery. By March, the Mint had run out of planchets (coin blanks, which temporarily halted striking. During this time, a new design – the Wreath cent – was quickly prepared and approved. 3. 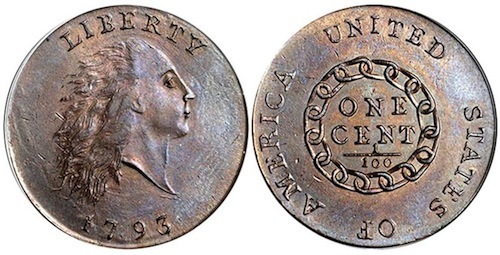 ^ 1793 Chain Cent Varieties, Collectors Universe, Inc.